This section is parallel to the Forth Road Bridge and is in the distal part of the Firth of the Forth. The section is of interest because it dissects a narrow section of the Firth of the Forth, with till mapped on the northern and southern flanks of the estuary that is overlain by post-glacial marine sediments. The narrowing of the Firth of the Forth is also associated with a narrowing of the interpreted Devensian palaeocoastline (Figure 2). 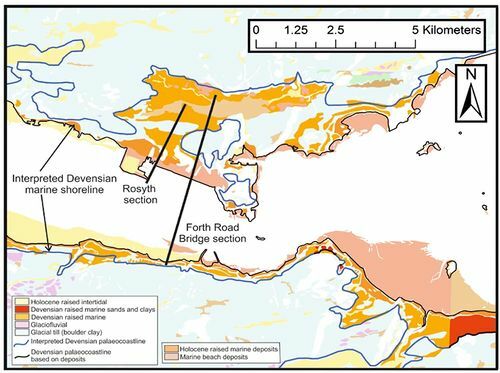 Figure 2 Geological map of the raised marine superficial deposits and interpreted Devensian palaeo-coastline at the Forth Road Bridge. Contains Ordnance Survey data © Crown Copyright and database rights . Figure 3 GeoVisionary image of the small hill near the Forth Road Bridge, comprising Till, surrounded by Devensian raised marine deposits. Figure 4 Groundhog section through the small till hill to the west of the Forth Road Bridge (Figure 2) (Vertical exaggeration is 10x). Borehole records used for interpretations are marked by the vertical lines with associated BGS borehole ID number. The northern most part of section is through a small till hill that is surrounded by Devensian-aged post-glacial deposits (Figure 2). On the superficial drift map, the northern side of the hill has been mapped as Devensian tidal flat sediments that are overlain by lacustrine sediments (Figure 2). The borehole records suggest that the entire Devensian tidal flat and lacustrine sequence comprises a 10–15 m-thick clay deposit. In the original borehole records the clay varies from sandy clay to silty clay. There are no sedimentary descriptions such as laminations or lagoonal macrofauna to help confirm a lagoon interpretation. Descriptions of the clay as firm/stiff in the lower part and soft in the upper part, this might suggest that the lower part of the clay is glacio-marine rather than marine. The borehole records in this area commonly document till under the clay, indicating that till underlies the glaciomarine clay north of the hill (Figure 4). South of the hill the deposit is mapped as a Holocene marine beach deposit. The borehole records consistently indicate a thin silt (1.3 m thick), followed by clay (c.4 m thick) and finally underlain by diamicton. Other borehole records in the Firth of the Forth all have the same silt to clay relationship in their uppermost part, suggesting a continuous bed of silt. In the original borehole records this upper silt bed (Figure 5) is generally described as containing shells. Furthermore, the underlying clay is described as a soft red clay. Figure 5 BGS Groundhog cross section showing the continuous upper silt bed near the Forth Road Bridge. Borehole records used for interpretations are marked by the vertical lines with associated BGS borehole ID number. The borehole records are not continuous across the Firth of the Forth within this area. Borehole record with BGS ID 962894, which is just offshore in the Firth of the Forth, documents a soft red clay and sandy clay deposit down to 57 m depth, but does not reach rockhead. Within the clay deposit are thin (0.5–2 m thick) beds of sand, which could be interpreted as channels, although these could also represent more continuous horizons. There are not enough borehole records in this area to distinguish between these two interpretations. A gravel bed is described in two boreholes, with a similar thickness and depth of c.2.7 m thickness and at 4 m depth. Some but not all of the onshore borehole records describe a thin gravel layer within the upper part of the clay. The continuity and extent of the gravel bed is unclear. Gravel at varying depths have been described in this area and interpreted as forming a continuous layer starting in the Firth of the Forth and continuing inland up to Stirling (Sisson & Rhind, 1970). The borehole records along the southern part of the Firth of the Forth show rockhead at around 23 m below the topographic surface, but most of the borehole records are situated along the estuarine margin so this is likely to be a minimum depth. Some boreholes contain sedimentary descriptions. For example, borehole record with BGS ID 18133378 (sloe to the cross-section of Figure 5), shows the uppermost bed is a silty clay that is rich in shell fragments and 1.7 m thick. It is likely that this bed correlates to the silt and shell beds on the northern side of the Firth of the Forth. Underlying the shelly silt is a 1.4 m thick sand and gravel bed, with sub-angular clasts. Underlying the gravel is a 1.9 m-thick interlaminated silt and clay sequence, which becomes sandier with depth. This is underlain by a firm clay, followed by a stiff clay, with occasional boulders and gravel. This lower most layer is 2.5 m thick and is likely to be a glaciomarine clay deposit. The topography on the southern margin is significantly steeper than along the northern margin, and the interpreted Devensian marine shoreline is observed significantly closer to modern shoreline, compared to the northern side of the Firth of the Forth. The borehole records (e.g. BGS IDs 18133378 and 18867823) through the deposits that are immediately offshore are relatively similar, with the upper part comprising a silty and sandy clay with layers of gravelly sand overlying a very stiff clay (glacial). The upper clay is 2.35 m thick, and the base of the unit is at 28.74 m A.O.D (Above Ordnance Datum). Combining the section with a more detailed assessment of the original borehole data provides better understanding of the key sediment types and relationships across in the area. The clay on the northern side of the till hill are mapped as Devensian-aged tidal and lacustrine deposits, but the boreholes provide no extra information to help define this environment. The area is within the mapped palaeoshoreline so is likely to have been below sea-level after the last glacial maximum, so that the post-glacial deposits are likely marine. However, the topography of this area suggests a small local embayment, which may have been a semi-enclosed lagoon setting. The area mapped as Holocene beach deposits comprises a shell-rich silt to clayey silt which is likely to be continuous across the Firth of the Forth, This bed is around 1 m thick, but varies in thickness across the Firth of Forth. The deposit is more likely to be a littoral marine setting rather than a true beach, due to: 1) the presence of shells, 2) fine-grained sediment facies, and 3) lateral continuity of the deposit across the Forth. Underlying the shell-rich silt/clay deposit is a unit of predominantly clay and occasional gravel beds. The boreholes all contain gravel or sand, with the gravel bed depths varying from c.2 to 4 m. The gravel is likely to be continuous across the Firth of the Forth in this area, although the lack of borehole records in the centre of the Firth of the Forth makes it hard to distinguish between a continuous gravel bed versus several channels. Some borehole records describe ‘sub-angular’ clasts in the gravel, which would be less characteristic of a channels and more representative of an ice raft deposit. Underlying the gravel is a clay unit, which is over 2 m thick and overlies a firm glacial clay. The mapped Devensian raised marine deposit on the southern side of the Firth of the Forth comprises silty and sandy clay with gravel, this is generally similar to the type locality for the Errol Clays Beds near Gallowflat just outside Perth (Peacock, 2003). This section is on the northern side of the Firth of the Forth, immediately west of the Forth Road Bridge. The section is approximately 2 km long, and starts onshore before continuing for approximately 1 km into the Firth of the Forth. The section is mainly focused on the Devensian raised marine deposits and infill of the Firth of the Forth. 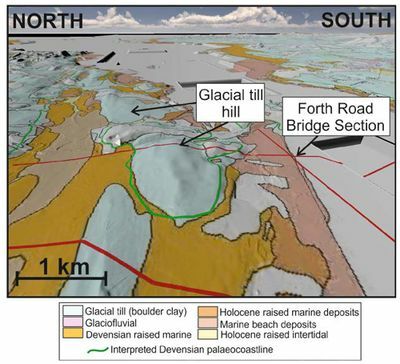 The northern part of the section is through the small east-west trending till hill (Figure 6), and has Devensian tidal deposit mapped in on its northern side. The deposit is described in the borehole records on the northern side include a soft to firm clay with silt and sand underlain by a dense gravel. Overlying the till hill is a thin clay layer, in the original borehole records this is described as ‘stiff’ and is therefore likely be part of the underlying till deposit. The southern flank of the small till hill is mapped as Devensian raised marine, Holocene raised marine and Holocene raised beach deposits. Borehole records in the area mapped as Devensian marine deposit predominantly comprise clay, which is underlain by till and overlain by a thin layer of sand and/or gravel (Figure 6). Further down slope is an area mapped as Holocene raised marine deposit that is overlain by a Holocene beach deposit. Borehole records (BGS ID 963655) in the area mapped as Holocene raised marine deposit comprising a 3 m-thick soft grey clay, overlying firm blue clay and a brown sand and finally bedrock. The firm clay and sand are likely to be glacial-related deposits due to their description as being ‘firm’. Figure 6 Northern part of Rosyth Section, with small Till Hill feature and mapped Holocene raised marine deposit and beaches. Borehole records used for interpretations are marked by the vertical lines with associated BGS borehole ID number. Further down slope in the area mapped as a Holocene beach deposit, the borehole records describe a sequence comprising sand and silt overlying either till or bedrock (Figure 6). The deposits are described (BGS ID 963735) as silty fine to coarse-grained sand with a fine to coarse-grained gravel and small shell fragments and is 1.8 m thick. Underlying the sand and gravel is a 1 m thick soft clay deposit, overlying a dense clay with gravel, sand and boulders, which is likely to be till. Moving offshore, the borehole records show a sequence of interbedded clays, silts, sands and gravels that are just over 20 m thick. The uppermost part of the sequence comprises just over 2 m of silt with shells, which is described in nearly all of the borehole records in the area. Underlying the shelly silt are a series of inter-bedded sands and sandy clay beds, with bed thicknesses of approximately 1 m. The sand and clay unit varies in thickness from 8 to 20 m (BGS ID 880699 and BGS ID 880709) overlying till. The area surrounding the east-west orientated till hill feature is mapped as a Devensian tidal deposit, with borehole records indicating that the sediments comprise clay which is locally underlain by gravel. There is not enough sedimentary detail in the borehole records within this area to distinguish between tidal versus raised marine deposit interpretation. Similarly to the Forth Road Bridge section (Forth Road Bridge), these deposits are observed within the interpreted marine boundary and therefore should be either Devensian raised marine or Devensian intertidal deposits. On the southern side of the till hill are three units, the highest being a Devensian raised marine deposit at 15 to 30 m OD. The borehole records indicate this unit to be predominately composed of clay, overlain by sand and gravel. This clay and sand deposit is similar in thickness and lithology to the Errol Clay Beds described outside Perth (Peacock, 2003). 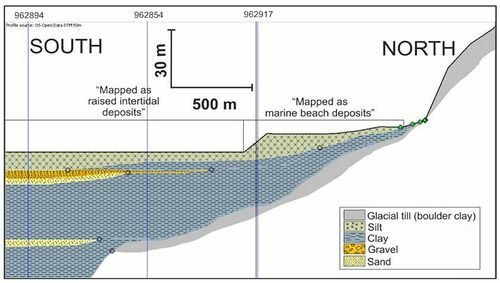 On the next topographic surface down from the Devensian marine deposit is the Holocene-aged raised marine and beach deposits (Figure 7). 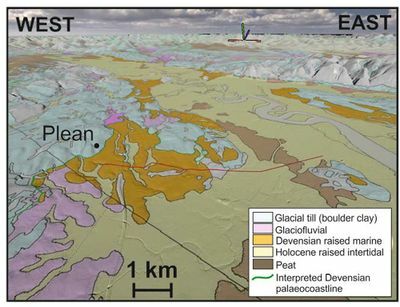 There is a clear topographic step down from the Devensian to the Holocene mapped surfaces (Figure 7). The area mapped as a Holocene raised marine deposit comprises a thin deposit of clay overlying till. The deposit becomes more variable down slope (southward) into the area mapped as a beach deposit, with more sand and silt appearing in the borehole records. The sedimentary relationship between the Devensian raised marine, Holocene raised marine and Holocene beach deposits are key to understanding this system but cannot be deduced through borehole records alone. 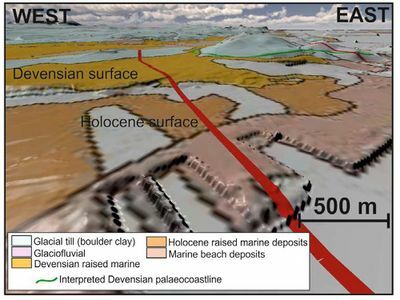 Figure 7 GeoVisionary view of the Rosyth section showing the relations between Devensian and Holocene raised marine deposits. The offshore part of the cross-section has number of similarities with the Forth Road Bridge section, with a continuous 1–2 m thick deposit of the silt containing shells making up the uppermost part of the sequence. This is underlain by interbedded sand, clay and gravel of up to 20 m thick. There is no continuous buried gravel layer described within any of the borehole records. The gravel units are described in some boreholes and are at highly variable levels. Sand beds (0.5 to 1 m thick) are observed throughout the borehole records at various depths, with slightly thicker clay beds (1 to 10 m thick) between the sand. This could be interbedded as a channelized sequence, such as tidal channels. The sequence is similar to the silty clays and sands of the Holocene-aged Claret Formation described at Grangemouth but with significantly more sand (Barras & Paul, 1999). The depth to the till is highly variably, but appears to rapidly deepen from approximately 6 m to nearly 30 m below the topography surface over nearly 800 m. This is suggestive of a major topographic low within the offshore area of the Firth of the Forth that has been subsequently infilled by estuarine clay, silt and sand. The Bo’ness cross-section runs across the entire width of Firth of the Forth near the town of Bo’ness (Borrowstounness), east of Grangemouth. This is an important section as is represent the start of the narrowing of the Firth of the Forth east of Grangemouth and up to the Forth Road Bridge. The interpreted Devensian coastline is still relatively close to the modern coastline on both the northern and southern margins of the Firth of the Forth in this area. The mapped till deposits on the southern margin of the Firth of the Forth form a broad flat surface that is gently dipping northwards at approximately 2–4°, before a terraced step near the modern coastline. The southernmost part of the section starts at the northern margin of this relatively flat till surface (Figure 8). Borehole records describe the till deposit as including stiff sandy clay with gravel and very stiff dark greyish brown sandy boulder clay. Figure 8 Overview geological map of the area covered by the Bo'ness section line. Contains Ordnance Survey data © Crown Copyright and database rights . Figure 9 Overview of the Bo'ness section. Borehole records used for interpretations are marked by the vertical lines with associated BGS borehole ID number. The southern margin of the mapped Devensian raised marine deposits is on a gentle northward dipping slope (Figure 9). Borehole records show that the area mapped as a Devensian raised marine deposit comprises a 1.5 m-thick sandy clay deposit overlying till. The deposit is mapped discontinuously along this steep northward dipping slope (Figure 8). The lower part of the slope is mapped as Holocene raised marine. The borehole records show that this unit comprises an upper sandy silt of nearly 3 m thickness on top of a 0.5 m thick gravel in turn overlying 7 m of grey silty clay. The mapped Holocene raised marine deposits at the base of this slope locally continues eastwards in this area (Figure 8). Undifferentiated tidal deposits form a broadly flat surface that is at or near modern sea-level. In this area the borehole records show a large variation in the sediment. Several borehole records (e.g. NT08SW107/5) show that the top of the sequence comprises a fine-grained clayey sand with patches of brownish-grey silty clay and abundant shell fragments (described as too small to identify), with a total thickness of 15 m. The available data in the area shows that the dominant deposit is clay, with subordinate sand, silt and gravel beds. In a number of the borehole records the uppermost bed is either a silt, sand or a sand and gravel deposit. There are no usable offshore borehole data in this area. The few borehole records (four) either only describe bedrock or show little useful detail on the superficial deposits. On the northern side of the Forth is Torry Bay (Figure 8), which is a generally flat area at just above modern sea level and is bounded to the north by a southward dipping slope (Figure 10). From borehole records the top of sequence in Torry Bay comprises a 1.5 m thick deposit of silt with shells. This is underlain by 4 m of silty clay, followed by another 4 m of silty clay but with occasional gravel beds. The entire unit overlies a unit of a 0.7 m-thick boulder clay (till). The uppermost part of other boreholes in the area comprises an approximately 30 cm-thick soft blue- grey sandy silt with shell fragments that is underlain by silty sandy clay with cobbles. Figure 10 GeoVisionary overview of Torry Bay on the Bo'ness section. 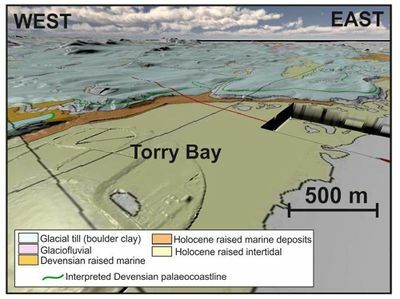 The southward dipping slope along the northern margin of Torry Bay has been mapped as Holocene raised marine (Figure 10) and the borehole records indicate that the unit comprises 1 to 4 m-thick sand and gravel deposit. This mapped deposit is approximately 300 m wide. At the top of this slope the mapping shows a change to a till deposit. The oldest superficial deposit across the Bo’ness section in the till forms a relatively flat surface along the northern and southern edge of Firth of the Forth. There is a topographic step down from the till surface down to a surface that is at just above modern sea level. Till deposits underlie deposits that are just above sea level, along the margin of the Firth of the Forth, at relatively a shallow depth of less than 5 m. This relationship suggests that the till blankets the bedrock surface, which has then has been overlain by younger glaciomarine and estuarine marine sediments. 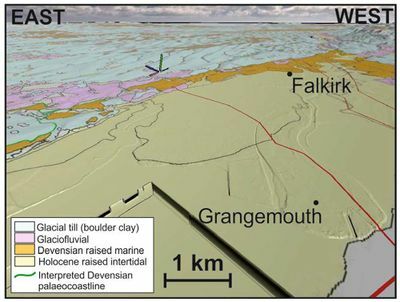 Devensian raised marine deposits are mapped on the northern and southern sides of the Firth of the Forth and comprise a 1.5 m-thick deposit of sandy clay that overlies till. These deposits are found on small steps on a southward dipping slope, rather than a larger flat topographic platform, suggesting deposition on the pre-existing, stepped erosional surface. The Devensian raised marine deposit are mapped in at 20 to 40 m A.O.D. (Above Ordinance Datum). The Holocene raised marine deposit is composed of sand, silt and gravel. These deposits are slightly coarser (likely representing a higher energy setting) than those of the Devensian raised marine deposits. The tidal deposit making up the surface just above modern sea level, are compositionally similar to those further east in the Firth of the Forth, with the uppermost bed comprising silt to sand beds rich in shell fragments. This is underlain by a clay deposit that is up to 15 m thick. Gravel beds are discontinuously observed in the uppermost part of the deposit. The sequence is similar to the Holocene-aged Claret Formation that has been described at Grangemouth (Barras & Paul, 1999). Furthermore, the uppermost shell-rich bed is likely to correlate with marine deposits further down the Firth of the Forth. This unit infills the northern part of the section at Torry Bay. The limited borehole records within the Firth of the Forth make correlating the Claret Formation equivalent deposit on the northern and southern margins difficult. If the unit is continuous then it is unclear if it thickens, thins or remains the same across the Firth of the Forth. The next section runs through Grangemouth and across to Longannet. The BGS superficial thickness model (red line in section lines) shows a major thickening of the superficial sediments beneath Grangemouth of up 160 m thickness. This sections focuses on understanding the composition of this sedimentary sequence and the surrounding relationships. The section starts (from the south) in a deposit mapped as Devensian raised marine to the south of the Firth of the Forth, then continues into undifferentiated intertidal deposits and back into a Devensian raised marine deposit on the northern edge of the Firth of the Forth. The interpreted Devensian-aged palaeo-coastline is just over 5 km inland (Figure 11) of the current Firth of the Forth at Grangemouth and only 1.5 km at Longannet. The main reason for the large inland distance of the Devensian paleo-coastline at Grangemouth is the large flat plain at just above modern sea-level from Grangemouth to Falkirk (Figure 11). Figure 11 GeoVisionary overview of the mapped superficial deposits and topography at Grangemouth. The borehole records from the area mapped as Devensian raised marine sediment comprise a 1.4 m thick deposit of sandy clay, followed by 2.3 m of cobbley clayey sand and finally overlying boulder clay (till). The mapped Devensian-aged deposit is on a flat surface that is approximately 850 m wide. Along the northern edge of the deposit the surface slopes down towards the north exposing the underlying sediments that are mapped as glaciofluvial (Figure 11). Borehole records through this dipping surface describe deposits such as a firm brown sandy clay and gravel and a dark grey silty sand. The deposits all overlie a stiff clay that often contains boulders (likely till). The base of the glaciofluvial deposit slope marks the start of a planar surface that is just above modern sea-level and is mapped as Holocene-aged raised tidal flat sediments. The rock head model for the area provides an idea of the shape of the over-deepening across the Firth of the Forth showing a clear asymmetry (Figure 12). On the southern side of the deepest point there is a gradual deepening from south to north, while of the northern side of the there is a relatively steeper deepening. The till thickness is thickest at the deepest point, and generally thins towards the margins of the area. Figure 12 Overview of Groundhog cross-section through Grangemouth. Borehole records used for interpretations are marked by the vertical lines with associated BGS borehole ID number. The sedimentary infill above the till comprises clays, silts, sands and gravels. Borehole records from the southern edge of the section indicates that sediments comprise predominately 8–20 m-thick deposit of clay. Along the edges of the tidal flat area the clay deposit is underlain by sand and/or gravel. Occasionally within the sequence there are 1.8 m-thick beds of grey clayey silt. Further northwards, across the Firth of the Forth the silt beds become thicker and more vertically repetitive (Figure 13). Boreholes from along this section describe the uppermost silt beds as being soft and grey and containing bands of shells. The clay in these boreholes is described as a soft grey silty clay. The borehole records describe both a silty clay and a clayey silt. In several borehole records, laminations are described within the silty clay deposits. Furthermore, beds of sand are described in several borehole records: these are either continuous beds or channels. Figure 13 Groundhog cross section segment from Grangemouth illustrating the interbedded silt and clay sequence. Borehole records used for interpretations are marked by the vertical lines with associated BGS borehole ID number. In the deepest part of Firth of the Forth in this area the sequence is made up of a thick sequence of clay and silts; the ratio of clay to silt varies across the available borehole records. In several of the borehole records near the deepest point, sands and gravels are described in the lower part of the sequence. In summary, sequence in this area comprises over 100 m-thickness of silt and clay sediments with some sand and gravel bodies, overlying a 20 m thick deposit of till. The borehole records from within the Firth of the Forth (over the deepening) provide no evidence for an upper bed rich in shells, as is commonly seen in the distal part of the estuary. On the northern side of the overdeepening the boreholes indicate a combination of clay, silt and sand, the ratio of which varies along strike. The borehole records in this area do not provide sedimentary descriptions and only describe thick sequences of sand, silt or clay. On the northern most edge of the section, is an area mapped as Devensian raised marine deposits. The borehole records from this area describe a deposit comprising sandy clay (0.4 m thick) overlying sand and gravel (3 m thick) and till (8 m thick). The till deposit forms an almost continuous unit across the region, underlying both the estuarine and raised marine deposits. On the northern and southern flanks of the section, the Devensian raised marine deposit is preserved on a raised step at approximately 30–40 m A.O.D. These deposits comprise a sandy clay that is typical of the Errol Clay Beds Formation described in the Tay estuary (Peacock, 2003). The raised marine sediments overlie sand and gravel sediments that is likely to be a subglacial deposit. The main intertidal area infill is just over 7 km wide and is just above sea-level. The infill of this area is predominantly silt and clay with occasional sand and gravel deposits. The silt and clay deposits range from 8 m to over 100 m thick. The silt and clay that underlie Grangemouth town are approximately 20 m thick and have been interpreted as the Holocene-aged Claret Formation (Barras & Paul, 1999). However, the thickening of the sequence in the deeper parts of the Firth of the Forth have not been previously described and it is unclear if they are only Claret Formation or part of a Clyde Clay Formation equivalent, representing the Windermere Interstadial. Skinflats is a village to the north-west of Grangemouth town. The section in this area is just at the edge of the overdeepening near Grangemouth town. This section crosses a large area mapped as Devensian raised marine deposits. The section runs south-west to north-east from Camelon, through Skinflats and to Kincardine. The section (from the south) starts in an area mapped as Devensian raised marine, which forms a 1.4 km-wide surface, with occasional outcrops of glaciofluvial deposits (Figure 14). The main part of the section comprises an intertidal deposit, forming a c.7.7 km wide surface. On the northern edge of the section, there is another area mapped as Devensian raised marine but only 400 m wide. On the northern margin, the interpreted Devensian coastline is close to the modern River Forth, but is over 8 km further south on the southern margin. Figure 14 Geovisionary overview of the Devensian raised marine deposits on the Skinflats cross section (see Figure 15 for cross section). Figure 15 Groundhog cross section through the Devensian raised marine deposits on the western most part of the Skinflats section. The Devensian raised marine deposit (Figure 14) is observed on a southward dipping slope, which dips from till and glaciofluvial sediments on its southern end, down to intertidal sediments (Figure 14). Borehole records in this area reflect a combination of clay, sand and gravel sediments overlying the till deposit (Figure 15). Along the southernmost part of the section available borehole records indicate till overlain by 6 m of gravel, overlain by 12 m of sandy silty clay. The next available borehole records are on the north-east edge of the deposits and show a change from clay dominant to clay and sand dominant deposits. Figure 16 Groundhog section through the intertidal deposits in central part of the Skinflats section. Borehole records used for interpretations are marked by the blue lines with associated BGS borehole ID number. 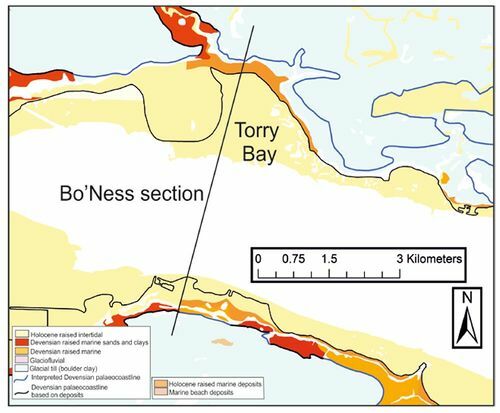 The BGS superficial thickness modal for the intertidal area shows a large variation in thickness of sediments across the section line (red line on Figure 16). Rockhead goes down to 80 m depth, with a relatively continuous thickness of 20 m of clay overlying a more variable 20–60 m of till. The areas mapped as intertidal sediments comprise predominately clay and silt with minor sand and trace amounts of gravel. Along the cross section line the southern part is clay dominant, however other borehole records in the area show a change from clay dominant to silt dominant. Several borehole records in the area describe shells within the upper silt beds. In addition, in the southern part of the section there are peat deposits described in upper part of clay sequence (Figure 16). In the northern part of the section the intertidal deposit is comprised >20 m-thick deposits of silt with minor sand and clay. The data from this area come mainly from a single site investigation (NS98SE2329), which describes slighter more silty sediment (Figure 16). The silt-rich section of the deposit also contains 0.5–1.2 m-thick beds of sand. The silt and sand section of the intertidal area continues up to the northern edge of the River Forth. On the northern side of the River Forth in the area mapped as intertidal deposit is a 4 m-thick clay deposit overlying till. On the northern end of the section there is step in the topography from 10 to 30 m A.O.D. The Devensian raised marine deposit is found on this slope, while the top of the slope marks the start of the till deposit. Limited borehole records through the Devensian raised marine deposit suggest that the predominant lithology is sand, gravel and sandy clay. The total thickness of this deposit is less than 3 m.
The till deposit in the Skinflats section infills the various topographic highs and lows in the underlying bedrock, forming and almost flat palaeosurface (Figure 16). Interestingly, on the southern end of the section the intertidal sediments are deposited on a gentle step in the till. On the flat top above the step, there is a Devensian raised marine deposit forming a relatively wide surface comprising predominantly sandy clay and sand. However, limited borehole data in this area puts a limitation on the accuracy of this observation. In comparison, on the northern margin of the River Forth the Devensian raised marine sediments includes sand, gravel and sandy silt, implying a slightly higher energy environment than is observed on the southern end of the section. The main intertidal fill comprises a mainly clay, silt, sand and trace amounts of gravel. Interbedded clay and silt form the bulk of the sequence, however the borehole record descriptions are often ‘silty clay’ or ‘clayey silt’, therefore it is unclear how accurate these descriptions are and how far interpretations can be taken. Discontinuous peat preserved in the upper part of the intertidal infill, suggest a short-lived terrestrial environment within the area. Along the northern part of the section, near the modern River Forth there is an increase in the number of sand beds in the borehole records. These sand beds could be interpreted as channels within the silt, due to increased grainsize relative to background sedimentation and not being continuous within surrounding borehole records. A similar sequence of repetitive sand beds is not seen elsewhere along the section. The thickness and composition of the Holocene infill above the till deposit is similar to those described for the Clarets Formation in Grangemouth (Barras & Paul, 1999). Unlike in the Grangemouth area, the overdeepening has been mainly filled with till rather than estuarine sediments. The Plean section line runs approximately south-west to north-east just to the east of the village of Plean. The section covers an area mapped as Devensian raised marine that overlies till and infills a small embayment (Figure 17). The cross section line continues into the Holocene-aged raised tidal flat to the north east. Figure 17 Geovisionary overview of the Plean cross-section line. In the Plean area there is a substantial surface mapped as Devensian raised marine deposits, which adjacent to till and glaciofluvial deposits (Figure 18). 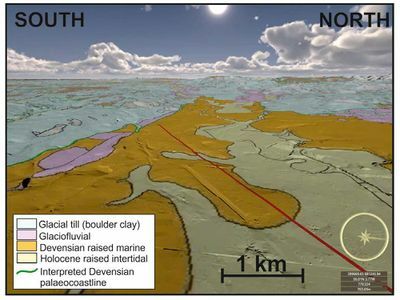 The Devensian-aged palaeocoastline is interpreted to follow the contact between the Devensian raised marine deposit and the till, which is as at nearly 40 m A.O.D. 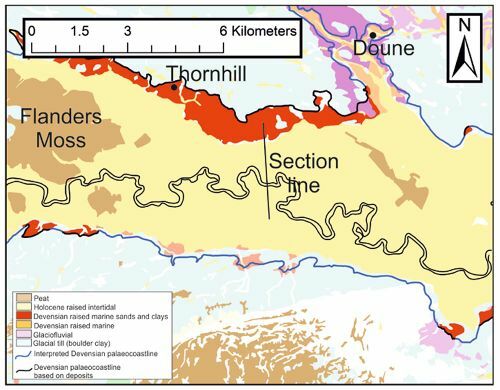 The interpreted palaeocoastline is between 4–7 km inland of the modern Forth River (Figure 18). The Devensian raised marine deposit in this area are observed on a surface that is gently dipping down to the south-east from 30 to 40 m A.O.D. The engineering geology map (Gostelow, Browne, & Cratchley, 1986) distinguishes Devensian-aged raised marine and Devensian-aged raised beach and deltaic deposits (Figure 19). The map suggests that Devensian-aged raised beach deposit overlies the Devensian raised marine deposit, and also on-lap onto the till deposit. The Gostelow & Browne (1981) map also describes a post-glacial (e.g. Holocene) raised intertidal flat deposit of the ‘Carse Clay’ Formation, which is now known as the Claret Formation. Figure 18 Geological map showing the Devensian raised marine deposits adjacent to till and glaciofluvial deposits surrounding Plean. Contains Ordnance Survey data © Crown Copyright and database rights . 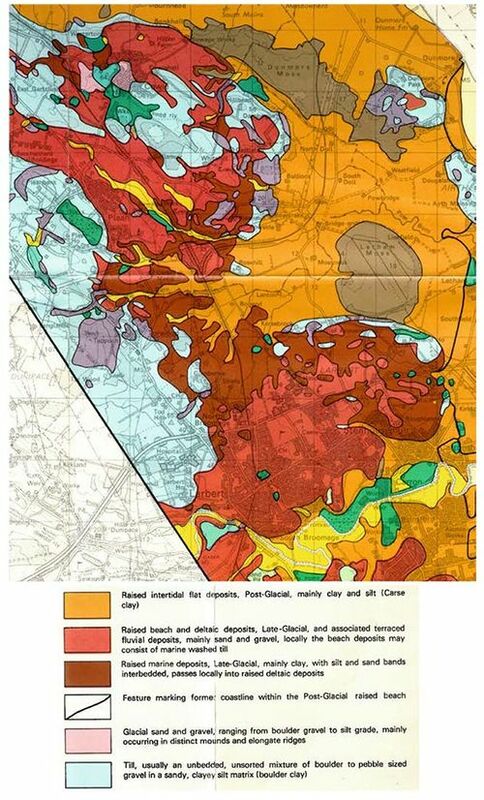 Figure 19 Extract from 1:50 000 superficial geology map from ‘Engineering geology of the upper Firth of Forth’ covering the Plean area (Gostelow, Browne, & Cratchley, 1986). Contains Ordnance Survey data © Crown Copyright and database rights . A 2 m-thick till deposit underlies the Devensian raised marine deposit in the Plean area (Figure 20). Locally, sand and gravel and minor boulders are described in borehole records directly overlying bedrock. Overlying both the till and the sand and gravel is an approximately 8 m-thick sandy clay deposit (Figure 20). In several borehole records the sandy clay deposit is overlain by a sand and gravel deposit that is just over 4 m-thick (Figure 20). This sand and gravel deposit is not observed in all the borehole records overlying the sandy clay, but is generally found in areas mapped as Devensian raised marine beaches (Gostelow, Browne, & Cratchley, 1986). Figure 20 Groundhog cross section through the Devensian raised marine, till and fluvioglacial deposits. Borehole records used for interpretations are marked by the vertical lines with associated BGS borehole ID number. Further along to the north-east the section moves into an area mapped as a raised intertidal flat, which from borehole records comprises silt and clay and minor amounts of gravel and peat. Underlying the intertidal deposit is a thin (<1 m thick) till deposit, which is locally absent. In general the borehole records suggest that the intertidal flat deposit is silt dominant in its southernmost extent, and becomes clay-dominant further northwards. The sequence is approximately 10 m thick. Overlying the entire sequence is a 3 m-thick peat deposit, which forms an 800 m wide by 4 km long sized deposit, orientated north-west to south-east (Figure 18; not shown on the section line). The Plean section provides an opportunity to look in detail at the potential Devensian raised marine depositional setting and the relationship of the Devensian raised marine deposit with the till deposit. The underlying till is thickest beneath the Devensian raised marine deposit, and thins and locally disappears northwards into the intertidal flat area. The composition of the till varies between ‘boulder clay’ and sandy gravels with occasional boulders. The lower sand and gravel is interpreted as subglacial glaciofluvial channel (i.e. esker) that has cut down into the boulder clay. The Devensian-aged marine deposit overlying the till and glaciofluvial deposit forms a nearly flat surface at 30–40 m A.O.D. On either side of the Devensian raised marine deposit there is till deposit that forms slightly higher topography. The Devensian raised marine deposit comprise a continuous 8 m-thick sandy clay, which is locally overlain by 3 m-thick sand and gravel. The sandy clay is likely to represent the raised marine deposit, due its similarity with the Errol Clay Formation (Peacock, 2003). The overlying sand and gravel is likely to represent the remains of an abandoned post-glacial local fluvial to deltaic drainage system within this small embayment. The intertidal flat deposit is representative of a significant change from the thick till and estuarine sequences at Grangemouth to much thinner glacial and estuarine sediments. The estuarine deposit is less than 10 m thick and overlie a discontinuous 1 m-thick till deposit. The Chartershall section runs north-west to south-east from just south-east of Chartershall, through Plean and along to Tappoch. The section starts (from the west) on till, then into glaciofluvial, then into Devensian raised marine and finally into a raised intertidal flat deposit (Figure 18). The section looks at glacial to raised marine to raised tidal flat sedimentary relationships. It crosses the Plean section. The section runs through the small marine embayment that was discussed in the Plean section (Section 3.6). The section also crosses the interpreted palaeocoastline which follows the till- raised marine and glaciofluvial-raised marine contacts (Figure 18). The westernmost 1.5 km of the section is through an area mapped as till. Borehole records through this area indicate that the till deposit comprises a combination of boulder clay, sand and gravel and clay, and is c.5 m thick (Figure 21). Boulder clay is only observed in the northern most part of section, for the rest of the section the area mapped as till comprises sand and gravel, and discontinuously overlain by clay. Most of the borehole records in the area suggest a superficial deposit thickness from 5–20 m. Further towards the north-west the mapped till deposit thickens and becomes boulder clay dominant. East of the till, the section cuts through a glaciofluvial deposit where the borehole records indicate a 3.5 m-gravel unit, which lies directly on bedrock. The gravel appears to form a continuous horizon from the area mapped as glaciofluvial into the area mapped as Devensian raised marine (Figure 21). Figure 21 Groundhog cross section illustrating the glacial and marine deposits sedimentary relationship along the northern part of the Chartershall section. Borehole records used for interpretations are marked by the blue lines with associated BGS borehole ID number. In the eastern part of the section is an area mapped as Devensian raised marine deposits forming a 3.6 km wide deposit, with a gentle south-eastward dipping upper unit from 40 to 20 m A.O.D. This unit comprises a 15 m-thick deposit of interbedded silty sand and sandy clay, with occasional beds of gravel. Glacial deposits beneath the raised marine deposits comprise a stiff boulder clay that is around 5 m thick. The gravel in the Devensian raised marine deposits is described as fine to coarse-grained with some inter-bedded sand. The sand is brown-coloured and fine to medium-grained with pockets of silty sandy clay. The sediment changes from being described as ‘stiff’ to ‘compact’ at the transition from raised marine to till. Figure 22 Groundhog section through the lower part of the Chartershall section, showing the full Devensian raised marine and intertidal deposits. Borehole records used for interpretations are marked by the blue lines with associated BGS borehole ID number. There is a topographic step down from the Devensian raised marine deposit onto the raised tidal flat. Borehole records indicate that the raised tidal flat deposit predominantly comprises soft grey/brown silty clay and occasional sand and gravel at the base of the sequence. The entire sequence is up to 18 m thick and overlies either bedrock or a thin (3 m thick) till deposit. The clay is described as dark grey/brown, silty and soft with occasional mottling. The north-east part of the section starts in an area mapped as till. The borehole records indicate that the mapped till comprises a boulder clay, sand, gravel and clay. In general, sand and clay is the dominant lithology. The clay is described as firm and sandy with gravel and cobble inter-beds. This suggests that the section line cuts in part through a glaciofluvial deposit rather than till. The mapping shows a change from till to glaciofluvial deposits towards the south-west, which is marked by a change to gravel-rich sediment overlying boulder clay (till). There is limited borehole records available for this area, therefore there is no constraint as to how the glaciofluvial deposit varies across the area. The Devensian raised marine deposit comprises a sequence of interbedded clay, sand and gravel overlying till. The thickness of the deposit is highly variable from 5 to 12 m thick. The boundary between the raised marine and till deposits is determined by the change in character of sediment from compact to stiff. The raised marine deposit in the area is typical of those described in Perth as the Errol Clay Formation (Peacock, 2003). The cross section shows a continuous gravel horizon through the glaciofluvial and Devensian raised marine deposits, which is likely part of an abandoned fluvial deposit overlying both the glaciofluvial and raised marine deposits. The raised tidal flat deposit comprises up to 18 m-thickness of soft grey/brown clay with occasional mottling textures. The type of sediment and thickness is typical of those described as part of the Claret Formation (Barras & Paul, 1999). The Stirling section is approximately 6 km-long and runs north-south through Stirling. The section starts in the south in Devensian raised marine and till deposits, then moving across Holocene-aged raised tidal flat and finally into a bedrock over-deepening at the foot of the Ochil Hills. There are two significant features in this area: firstly the over-deepening along the base of the Ochil Hills (Figure 23); and secondly, the two topographic highs on either side of the River Forth resulting in a local narrowing of the valley (Figure 23). Stirling Castle and Wallace Monument are located on the topographic highs. The overdeeping feature is mapped as a raised tidal flat with small patches of Devensian raised marine along its margins. The topographic highs are mapped as being partially overlain by Devensian raised marine sediments. Devensian raised marine sediments have been mapped partly surrounding the two topographic bedrock highs. The section runs just east of the topographic highs and into the western edge of the buried valley system. Figure 23 Overview map of the superficial geology surrounding the Stirling. Contains Ordnance Survey data © Crown Copyright and database rights . The sections starts in an area mapped as Devensian raised marine deposit, which comprises 8 m-thick sandy clay and occasional gravel. The sandy clay deposit overlies a thick (>20 m thick) deposit of boulder clay (till). The deposit forms a gentle 600 m wide north-eastward dipping slope (Figure 24) from just over 40 m A.O.D. down to 20 m A.O.D. Figure 24 Geovisionary view of the southern end of the Stirling section, showing the northward dipping slope comprising Devensian-aged raised marine deposits. At the base of Devensian raised marine slope is an almost flat plane at less than 10 m above modern sea-level, which has been mapped as a raised tidal deposit. The rockhead level significantly varies across the section, varying from 18 to 60 m depth, but reaching over 100 m depth at the buried valley feature (Figure 25). The section has a deepening beneath Stirling City, a minor deepening at the Forth River and a major deepening at the base of the Ochil Hills (Figure 25). Figure 25 Overview of the Stirling section in Groundhog. Borehole records used for interpretations are marked by the blue lines with associated BGS borehole ID number. Underlying the raised tidal deposit is till that varies in thickness from 2–40 m. The till is thickest (c.30 m) in the over-deepening area, it is thinnest underneath the modern Forth River and absent beneath Stirling (Figure 25). Notably, beneath Stirling City where till is absent, there is a channel shaped downcutting in rockhead filled with sand, silt or gravel. The majority of boreholes surrounding the cross section line show a predominantly clay-rich sequence, suggesting that the sand and gravel deposits are discontinuous across the section. The sand and gravel are generally concentrated along the deepest parts of section, and between areas the sediment is dominated by clay. The deepening between Stirling and the Ochil Hills is sand dominant, whereas the modern Forth River is gravel dominant. The clays are described as soft to firm, grey to grown, silty, sandy and occasionally mottled. The silt is described as loose grey and clayey with bands of grey silty clay. Several of the borehole records describe laminations in the clay. Occasionally, the gravel is described as being sub-angular and containing cobbles. The southern end of the section is in a Devensian raised marine deposit, which was deposited on a gently north-eastward dipping palaeo-slope formed on the till. The sandy clay deposit with occasional gravel are typical of the Errol Clay Formation (Peacock, 2003). The till underlies the marine deposits and continues inland and into the Forth Valley beneath the raised tidal sediments. The raised marine sediments are deposited on the gentle northward dipping surface and do not continue onto the flatter surface. 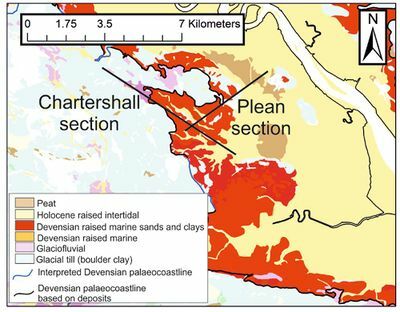 The area mapped as a raised tidal flat deposit, underlying Stirling, has a significant variation in estuarine infill thickness and till thickness and composition. The till thickness is highly variable across the section. The thickest till deposit is observed in the Ochil Hills overdeepening, with thinnest deposit observed beneath Stirling City. This suggests a combination of draping of till on palaeo-surfaces and the infilling of pre-existing topography. The large variation in depth of rockhead and the channel shaped features in the bedrock indicates significant bedrock erosion prior to deposition of the till. The intertidal sediments infills the remaining accommodation space in the Forth Valley above the till with clay, sand, silt and gravel. The main infill of the tidal sequence is grey brown sandy clay, however in the areas of interpreted channels cut into bedrock there is an increase in sand and gravel. The sand and gravel deposits do not appear continuous across the surrounding boreholes hence these are interpreted as channels, which are forming on the older pre-existing drainage pathways. The repetition and depth of the sand and gravel deposits are highly variable across the section. Underlying Stirling City there is one sand and silt channel identified in the upper part of the sequence. At the location of the modern River Forth, there is a wide gravel deposit forming the entire intertidal infill sequence. Finally at the base of the Ochil Hills there are at least three sand channels identified that spread equally down the entire section. The channels underlying Stirling and the modern River Forth are generally in line with the eastward flow direction down the Forth Valley. This section is the most western section, and is in the proximal part of the Forth Valley catchment. The section runs north to south for approximately 3.8 km, to the south-west of the town of Doune and beside Blair Drummond safari park (Figure 26). The section cuts across areas mapped as a Holocene-aged raised tidal flat and Devensian raised marine deposits. Figure 26 Overview geological of the Doune section line. Contains Ordnance Survey data © Crown Copyright and database rights . The section line start south of the Forth River, before the river heads up to Loch Ard, and the hills of the Loch Lomond and Trossachs national park. 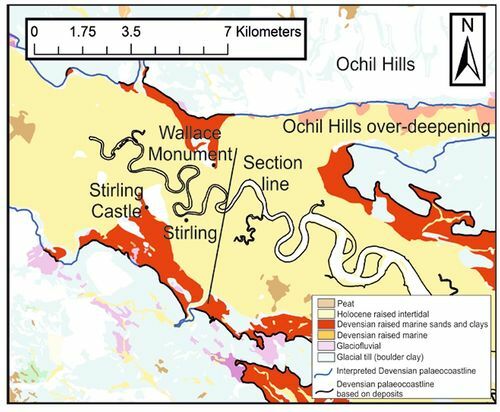 The section runs across a raised tidal deposit surrounding the River Forth, and up into mapped Devensian raised marine deposit to the north (Figure 26). The interpreted Devensian palaeocoastline runs through the surrounding till deposit at just below 40 m A.O.D. There is approximately 4.8 km between the northern and southern Devensian palaeocoastlines in this area. The rockhead surrounding the River Forth is just over 20 m depth, but occasionally reaches depths of 45 m, at the southern part of the section (Figure 27). The superficial thickness model shows a significant thickening of the superficial deposits along an east-west transect just south of the River Forth. This deepening appears to form an east-west channel-shaped feature that is infilled with till and post-glacial sediments, including sand, silt and peat. The post-glacial sand and silt are described as silty, fine-grained, laminated, soft, grey and with 10 cm thick gravel bands. In addition, 40 cm-thick buried peat beds are observed within the silt and clay. A thin (20 cm thick) peat layer is observed overlying the silt filled channel (on the southern part of the section) at approximately 20 m depth (Figure 27) (BGS ID 623409). Thin peat beds at similar depths are observed in several of the surrounding borehole records in the area. The remaining fill of the raised intertidal flat comprises up to 26 m thickness of clay described as light grey to brown, with mottling, interlaminated plant material, poorly laminated and occasionally contains shell debris. In a number of the borehole records along the northern and southern edges of the raised intertidal flat, an approximately 4 m-thick sand layer is described in several borehole records. The sand is described as fine to medium-grained and angular to sub- angular. Figure 27 Groundhog section through the raised tidal deposits at the Doune section. Borehole records used for interpretations are marked by the blue lines with associated BGS borehole ID number. On the northern side of valley, the Devensian raised marine deposit is mapped on a gentle southward dipping slope, which is nearly 1 km-wide and dips from 30 to 20 m A.O.D. Borehole records from this area indicate that the deposit comprises interbedded sand, gravel and clay overlying a 2 m-thick till deposit that is directly on bedrock. The sands are silty, fine to medium-grained and contain pebbles of sandstone and siltstone with some imbrication. The thin clay deposit is silty, stiff, mottled and yellow to blue in colour. The west of Doune section is located in the proximal part of the Forth Valley, which represents one of the furthest inland mapped Devensian raised marine deposits in the area. This region is proximal to the Highland Boundary Fault representing a major change in the topography, and the limit of the Loch Lomond glacial readvance (Evans & Wilson, 2006). In this area, the mapped Devensian raised marine deposit is only seen on the northern side of the valley. The main valley area is mapped as an alluvium deposit. This area is a similar width to the distal part of the Forth Valley Catchment at 4–5 km wide. The mapped Devensian raised marine deposit is observed at a similar height to other areas further down the catchment and on a slope dipping towards the River Forth. The mapped deposit terminates at the top of the slope and from borehole records is directly on till. Unlike further downstream, the Devensian raised marine deposit in the area is sand-rich and not clay-rich, and is interpreted in borehole records as a beach deposit (BGS ID 625736). Most of the borehole records describe imbricated pebbles within the deposit and a fine to medium-grained sand, which would fit with this interpretation. The area mapped as an intertidal deposit forms a continuous mapped surface with areas downstream. The borehole records indicate that the deposit predominantly comprises a light grey to brown clay with plant material and shell debris that is up to 26 m thick. This is typical of the Claret Formation, representing estuarine infill of the valley. Discontinuously underlying this clay is a thin layer of peat, suggesting a short lived sub-aerial environment. On the southern end of the section the deeper channel feature cut into bedrock is infilled with a nearly 20 m-thick deposit of silt and sand with bands of gravel, which are interpreted in the borehole records as representing a marine setting. Although no description of shells is provided a silty sand is typical of the Errol Clay Formation described elsewhere. Not all borehole records in the area reach bedrock or top till. However there are boreholes that reach either rockhead (with no till preserved) or top till, suggesting a discontinuous till layer in the area. The mixed preservation of the till deposit is suggestive that it has been partially eroded away in the area. ↑ SISSONS, J, and RHIND, D. 1970. Drift stratigraphy and buried morphology beneath the Forth at Rosyth. Scottish Journal of Geology, Vol. 6, 272–284. ↑ 2.0 2.1 2.2 2.3 2.4 2.5 PEACOCK, J. 2003. 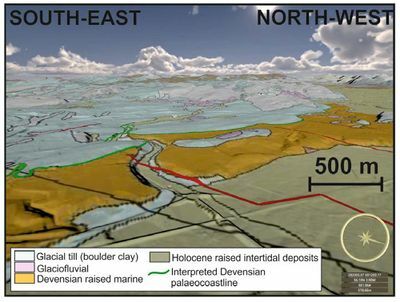 Late Devensian marine deposits (Errol Clay Formation) at the Gallowflat Claypit, eastern Scotland: new evidence for the timing of ice recession in the Tay Estuary. Scottish Journal of Geology, Vol. 39, 1–10. ↑ 3.0 3.1 3.2 3.3 BARRAS, B F, and PAUL, M A. 1999. Sedimentology and depositional history of the Claret Formation (‘carse clay’) at Bothkennar, near Grangemouth. Scottish Journal of Geology, Vol. 35, 131–143. ↑ 4.0 4.1 4.2 GOSTELOW, T. 1986. Engineering geology of the upper Forth Estuary. British Geological Survey Research Report, CG16/08. ↑ EVANS, D J A, and WILSON, S B. 2006. Scottish Landform example 39: The lake of Menteith glacitectonic hill‐hole pair. Scottish Geographical Journal, Vol. 122, 352–364.